I was going to wait until I had these in hand to announce them, but I was pretty excited when I got the proof photo today. The face of the coin is a duplicate of the manhole cover that covers the red rock that was originally the Initial Point. What is the Initial Point you ask? In 1854 the Kansas Nebraska act was passed, setting forth a system for the settlement of the plains states. Up until that time, everything west of Missouri was open territory, no land owners, no laws, nothing remotely resembling civilization. 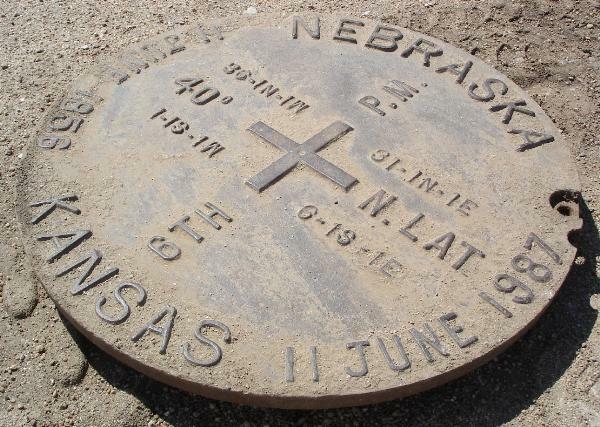 The 40th N. Latitude was selected as the baseline boundary between the Kansas and Nebraska Territory. Before the plains could be settled, a survey system needed to be set up. Charles A. Manners set forth to survey this line, that we now know as the Kansas Nebraska border. 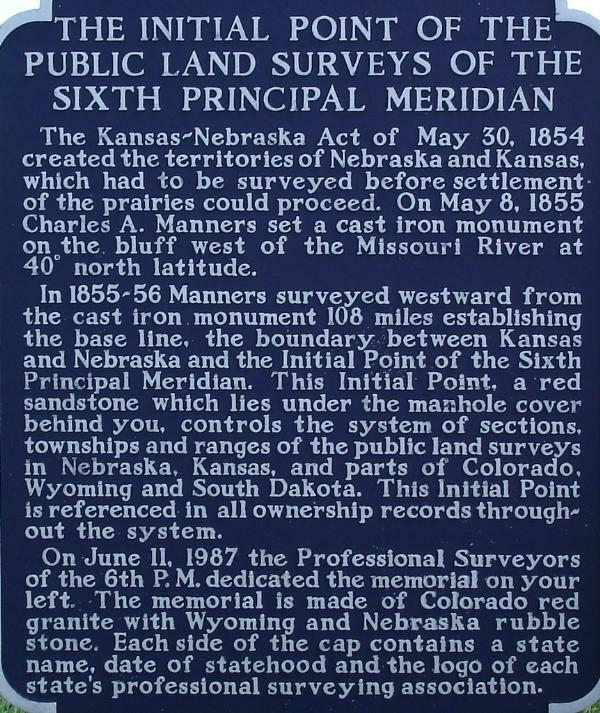 He surveyed across the Missouri River into what is now the north east corner of Kansas and set a 640 pound cast iron marker on a bluff, overlooking the Missouri River. That marker is known as the Point of Origin or Point of Beginning. Manners surveyed west 108 miles along the 40th N. Latitude in 1855 and 1856. The survey team came and went, conditions were very harsh in an inhospitable prairie. They had several skirmishes with the Native Americans. Manners had to be an incredibly dedicated individual to take on this project and complete it like he did. When they reached the 6th Principle Meridian, he buried a non-native red sand stone in the center of a wagon wheel. That red sand stone marked the Initial Point for the survey of Kansas, Nebraska, Parts of S. Dakota, Colorado and Wyoming. All land ownership records throughout the system refer to the Initial Point, a red sand stone buried in 1856. The system of townships, roads, and ranges throughout these states was surveyed off of this rock. 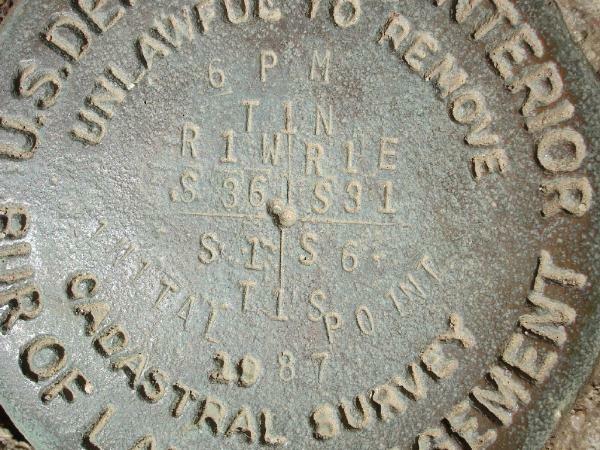 The collective surveyor's associations from these five states decided to try to recover the original red sand stone. They found it exactly where it should be, only it was in the middle of a two lane dirt road with very little gravel. They recovered it on June 11, 1987....131 years to the day after it had been set. After recovering the Initial point, they set in a manhole tube and paved about 60 feet of the road to keep the tube from being destroyed by traffic on the roadway. They designed the manhole cover that I used for the face of the coin to cap the tube. The cover includes Nebraska on the north, Kansas on the south, 6 P. M. for the 6th Principle Meridian and 40th N. Lat for the obvious. There are some oddities that we incorporated into the coin. Instead of using a W letter for west, they used an upside down M letter. The side of the cover has an indent to pry the cover out of the tube and an alignment hole. We also incorporated those into the coin. Those of you that like to attach a travel bug tag to your coins, this one has a hole in it you can use for that. The BLM set a benchmark in the historic rock. One would think that a rock that had served for over 100 years as a benchmark would be good enough. The BLM saw other wise and set a marker. They used the number 1 for the letter I and misspelled Initial, it is INITAL in the benchmark. "a survey relating to land boundaries and subdivisions, which is made to create units suitable for the transfer of or to define the limitations of a title; surveys of the public lands of the US, including retracement surveys for the identification of and resurveys for the restoration of property lines; and for corresponding surveys outside the public lands, although such surveys are usually termed land surveys"
I thought they had misspelled Coastal, but it turns out they need more credit than I was giving them. We tried to duplicate the Cadastral Survey marker as closely as we could and it is on the back of the coin, at the bottom. The back also gives a short history of the Initial point and has a simulated rock that the benchmark is set in. The coin just has the west coordinates as common sense should prevail for the north coordinates. They will have an icon and are trackable, of course. I had to go to a 3" coin to get the history on the back of the coin. We tried a 2" coin and the print was just too small. Freight from the mint was close to 600 dollars, so they must be fairly hefty. They are 5mm thick. 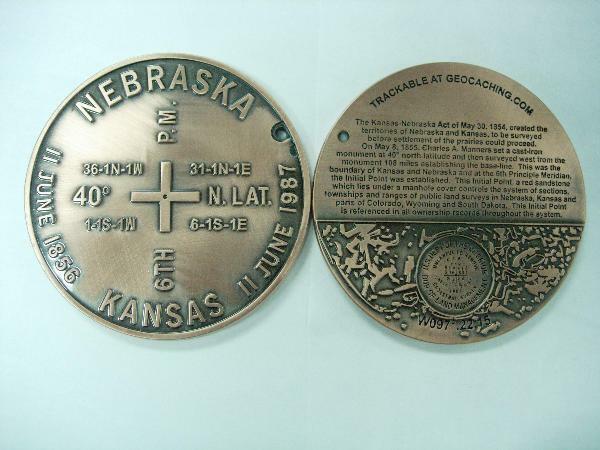 I ordered them in four colors, 150 black nickel, because the cover was black cast iron, 150 antique brass because the Geodetic Center coins came out so nice, 100 copper and 100 antique copper. A total of 500 coins. There will be no limited edition or higher costs for any one color. When I get the final costs figured out and they are in hand, I will post again. I am expecting them to be in the same range as the Geodetic Center coins. A three inch coin is huge, just take a ruler and a two inch coin and add an inch. An inch does not sould like much. Wrapping one to protect it and putting it in a 000 mailer appears to be a tight fit, so I ordered the next size larger mailer. Now I am playing the hurry up and wait game. Great history lesson. I'll probably be in for 2. That's a big 'ole coin. Forgot to ask - does it come with a hernia disclaimer? Or a warning that it should not (but COULD) be used as a weapon? I am a Land Surveyor and this is the first survey related geocoin other than the GCC Benchmark coin. I wouls be interested in purchasing 1 of each metal type. Put me down for 4 when the preorders start. Great coin. Please put us down for 1 of each metal. Will be going for one of each metal. Let me know when they're available. Thanks. Let me know also when they come in. I'll probably take all four. Very cool coin, will definitely need at least 3, maybe all 4 depending what the copper looks like. Wow, thanks for the historical information! When you start taking orders I'll be in for two antique coppers. Another great coin, Glen! Count me in for one of each color too. Thanks! There's a photo of the manhole cover! We will definatly be wanting some of these, when you start the ordering! LOVE the history lesson! THANKS!! Great history lesson! Put me down for 2! Thanks Glen! Great looking coin. Would be interested in three if you are taking pre-orders. I'll take at least one. Slightly meta, but is that the correct spelling of "principal/principle"? I would think that "princial", meaning primary, would make more sense in the context than "principle", meaning a rule or guideline. And here I had a nice explanation all typed up, only to find that you've already replied! Well, heck, I'm going to print it, anyway! No sense letting my golden prose go to waste! Anyway, while it certainly would be nice if this could be corrected, I'm not going to let it bother me if it can't. I'll just fill in the two offending letters and re-engrave the proper ones! I can't resist a three inch coin. Put me down for one of each metal. When the time comes to list them for sale, I will contact everybody that posts on this thread first, then post the new for sale thread. I have not been to the post office with these yet and do not have a per coin weight, but I am pretty sure $12.00 US per coin, freight included will have them covered. I'd like to be in for one! Put me down for atleast one regular copper. Seems like I better get my nick on one of each metal. I didn't see this either so I better speak up. One of each flavor for me, please. These rock!! Love the coin and the history behind it. I'm interested in getting 3. I'd like one of the antique brass. Could I put my name down for one brass and one antique copper if possible please. Thanks. We would like one too please! Would like one in any of the antique finishes. Getting my name on the list . I would like three. I know what the mission for one of them will be. I just got official word back, it is too late. I see that I also spelled it Principle in my history on the original post... Nobody is at fault here, except myself of course. I would like 2 of each please. This is a PERFECT coin in my opinion. I really like the coins that relate back to surveying, treasure-hunting and technology. Just to be sure there's no mistake, I will take one of each metal. Even with the mis-spelling this is a great coin. Good Work! I would like to get one in each metal please. If you make the coin in solid brass, please put me on that list for atleast one. Thank you and great looking coin. Can't wait to see it.